The best and safest way to transport a concrete pump to any inland port in the United States is using a flat bed truck, or even low boy truck (depending on the type of concrete pump ). 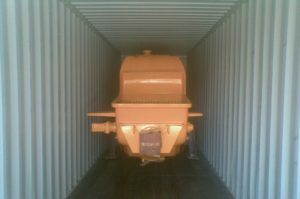 “We decided to transport my trailer pump from Georgia to the port of Miami, and the freight company who picked it up sold me a flat bed rate. To save money I guess, they decided to use a pick up truck to tow my machine all the way down to Miami. For most countries the best way to transport cargo is through containers. Assuming you have a freight forwarding agency, the unit would be prepared for loading prior to the embarkation port. Make sure the trucking company gets a dock receipt, and check that the freight forwarder has the facilities to load and secure the machine into the container. From their location, the freight forwarder will re-route the container to the port of embarkation. Once the vessel has left the port, the shipping line would produce a BL (bill of loading) showing confirmation that the cargo has departed. Generally, containers can take anywhere between 15-45 days to reach destination, depending on the location. South America is normally 1 week; countries like New Zealand or Australia are 45 days.